Starbucks is rocking the trends lately. First, we were given the limited edition Unicorn Frappuccino and Starbucks stores across the country sold out so quickly, baristas had to get creative. Then came the Dragon Frappuccino: the brainchild of a barista who had left over unicorn ingredients but not enough to make ... well, a full unicorn beverage. And now ... drum roll, please ... The Mermaid Frappuccino. According to Instagram user TheModernBarista, Jócelyn Freeman, her store sold out of the unicorn frappuccino on the first day of its launch. Instead of disappointing customers, she created the Mermaid Frappuccino by taking the Pokémon Go frappuccino (Wait! What? Who knew?) and removing the raspberry syrup while replacing it with a toasted coconut matcha sauce. Let's start off with what in the world a Pokémon Go Frappuccino is. According to Starbucks official site, it's a limited time only drink that begins with a vanilla bean base, then blended with raspberry syrup and freeze-dried blackberries, topped off with whipped cream. This kind of sounds AH-mazing, don't you think? But, if you're still into the mermaids, I can help you out! What ingredients are in a Mermaid Frappuccino? No mermaids are harmed in the making of this beverage. To make the drizzle—mix 8 pumps of white mocha, 3 CBS pumps (cold bar pump) of toasted coconut and 3 heaping scoops of matcha in a pitcher until smooth. How do you order a Mermaid Frappuccino? 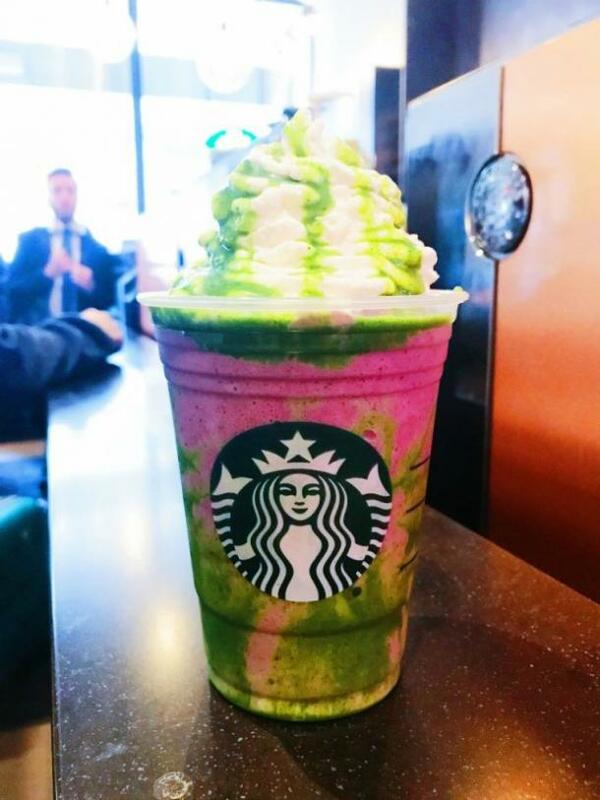 You're more than welcome to give them the above ingredients but it may be easier to just order the Pokémon Go Frappuccino and ask for no raspberry syrup and have them drizzle the cup and top with whipped cream and matcha powder. FYI: Matcha powder is green tea, which was used in the Dragon Frappuccino so basically, it's like its distant cousin. I may hold out until they make a Werewolf Frappuccino with a vanilla bean base, gray drizzle, and some chai tea for that extra bite. Get it? Bite? Werewolf? No matter what you get; ENJOY!